Welcome to the Spirit Riding Free Giveaway! Spirit Riding Free is a great new show for children but even more so if they are fascinated with horses. You can read more about the love of the show and the horses as Holly and Rachael have previewed Spirit Riding Free. Also check out the activity sheets that she has posted! 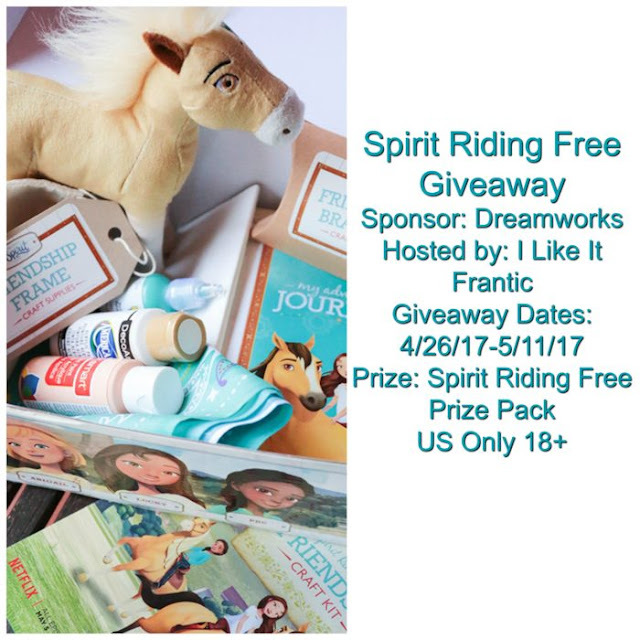 May is almost here, which means it’s time to “saddle up” for the premiere of DreamWorks Animation’s newest original series Spirit Riding Free, available exclusively on Netflix on Friday, May 5. The series, inspired by the Oscar®-nominated film Spirit: Stallion of the Cimarron, follows the heartfelt journey of a gutsy 12-year-old girl named Lucky who befriends a wild mustang whom she aptly names Spirit. With her two best friends (and their horses) by her side, Lucky and her friends explore a world filled with endless rides, magnificent horses and and never ending fun! Together they’ll push their own limits, harness the power of friendship and discover what it truly means to be free. a Rafflecopter giveaway We reserve the right to make revisions, to cancel, or suspend this contest for any reason. We are not associated with any of the companies named above. The odds of winning are based on the number of entries received Open to the US 18+ only. Confirmed Winner(s) (by Rafflecopter) will be contacted by email. Winner has 24 hours to respond before a new winner is chosen. No purchase necessary. Void where prohibited by law. The sponsor will be responsible for product shipment to winner of this giveaway. I Like It Frantic (and any other blog participating) is not responsible for product shipment/delivery. This event is in no way administered, sponsored, or endorsed by, or associated with, Facebook and/or Twitter, Google, Pinterest. This disclosure is done in accordance with the Federal Trade Commission 10 CFR, Part 255 Guides Concerning the Use of Endorsements. Entrants must only enter with either one email address, IP address and/or Facebook account, anyone found violating these rules will be disqualified. It is at the sole discretion of the admin of the giveaway if the winner has met the rules or not. My daughter is a huge horse lover and a fan of the movie Spirit. My niece, Gia, is the Spirit Riding Free fan. Thanks! Our sweet Samantha loves horses! She would love this! My grandniece Allison loves horses and would be absolutely gaga over this!